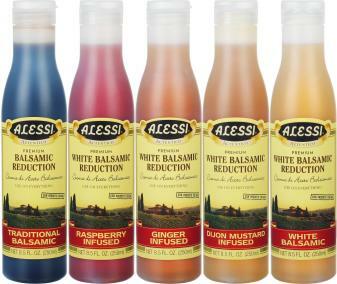 Alessi is pleased to introduce its newest product line: Balsamic Vinegar Reductions. The sweet syrup-like products can be put on everything. They are made from boiling down authentic Alessi Balsamic Vinegar to release the water and create syrups. As the vinegar is reducing, it must be watched carefully to ensure it doesn’t over boil and caramelize. Alessi has gone beyond regular balsamic reductions and explored other flavors also. In addition to Balsamic Vinegar Reduction, Alessi is also selling White Balsamic Vinegar Reduction, Raspberry Infused White Balsamic Vinegar Reduction, Ginger Infused Balsamic Vinegar Reduction and Dijon Infused White Balsamic Vinegar Reduction. This ensures that Alessi offers a reduction for any of your food needs. Alessi’s Balsamic Vinegar Reductions can be used on literally anything. They are especially good as a glaze over any vegetables, pastas, rice or meats. The reductions help to bring out the flavor in the dish. They also go well in salad dressings or as a decorative touch to a dessert dish. One of the most popular uses for reductions is over fruits, especially berries. A unique but delicious idea is to serve fresh strawberries over a vanilla ice cream and drizzle a balsamic reduction over the top. Since the berries have less moisture than most fruits, the reduction really brings out their sweetness.